These are songs that suggest that this is how Steve Mason has always wanted Steve Mason to sound. 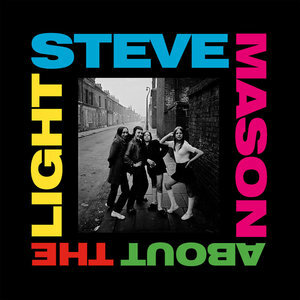 On new album About the Light, Steve Mason comes across as an artist unafraid of the obvious. Rather than look for the new, he instead manages to put a fresh spin on old sounds. Buoyed by finding love, becoming a father, and settling in Brighton, Mason channels the positivity in his life on songs that capture the joy of simply making music. Joined by legendary producer Stephen Street, the pair pan for pop gold and between them uncover golden nugget after golden nugget on his most celebratory and immediate album to date. Opener "America Is Your Boyfriend" starts with the slow swell of swampy brass, cowbell and gently strummed acoustic guitars. The song would appear to be a comment on Anglo-American relations but one that doesn't get bogged down in the polemic at the expense of a thrillingly euphoric hook. Mason pulls the whole thing together in glorious fashion with a unifying, uplifting refrain of "We believe in Life" before the song bursts into life with a chorus of "This is the lie / This is your smile / America is your Boyfriend." Throughout, Mason harnesses the power of the brass section as he encourages it to grow before curtailing it, only to let it off the leash completely in the final third as brass and guitar thrillingly trade blows. Over a delayed, drum beat, clean guitar and the familiar, and welcome, appearance of a melodica, Mason gracefully whispers in his characteristic higher register on "Rocket". Whereas on some of his past solo work, this might have marked a fragile exploration of his darker mental state, here he sounds confident and bolstered by where he finds himself in life. His only concern now seemingly being how to articulate his feelings for the special people in his life. Like many of the songs on the album, there is a jubilant, pop melody just waiting around the corner as the trumpets swell and the guitar drifts in to take the whole thing home on a swaggering wave of euphoria. "No Clue" shows what an underrated rhythm guitar player Mason is as his quick guitar chord changes and R.E.M. jangly notes frame his more direct delivery with each syllable toppling into the next like the steady fall of dominos. The title track captures an exuberant mix of blues, rock 'n' roll, and soul that together wouldn't sound out of place on Exile on Main Street. It finds Mason at his most playful with instruments weaving in and out of the song until descending piano notes take the song to it's memorable vocal hook of "get out your life and go home". In the context of Mason's career, it's something of a bold move as he sticks as closely to a traditional rock 'n' roll song as he's ever done before and it comes off brilliantly. "Fox on the Rooftop" works as an almost night time lullaby with floating keyboards and chiming guitar notes acting as a calming bed for Mason's soft vocals. It takes time to take hold before enveloping the listener in the gloriously understated melodies. "Stars Around My Heart" raises the tempo as it rides one of the best riffs on any Mason record to date. A Carlos Alomar, David Bowie Young Americans era inspired, biting riff that blazes through the song. The muted power chords on "Spanish Brigade" signal the calm before the storm as the song builds to an exhilarating rush. It shows a directness and confidence that feels welcome and fresh and something Mason hasn't necessarily tried in his long career to date. "Don't Know Where?" is more meditative as the song opens with Mason sounding initially, in the context of this album, a little lost "I don't know where I'm going / I don't know where I've been." However, it soon becomes clear that he's simply content with the here and now rather than fretting over the past or the future. The stomping blues blast of "Walking Away From Love" features a bone dry Bo Diddley-esque guitar riff as Mason spits out rhyming couplets with backing singers intoning the song title. Mason sounds like he's having an absolute blast as he shifts from rocking out to soulfully lifting the song skywards on a stirring, dizzying chorus. "The End" concludes the album on a fittingly positive note. Appropriately for an album that wears its pop heart on its sleeve it doesn't shy away from the chorus which is as close to indie pop perfection as Mason has ever come. About the Light is Mason at his most confident. Having put greater distance between his situation now and the situation that saw him in the grip of crippling depression has meant he can finally just enjoy the art of writing music. As a result there are tunes here. Big tunes. There are also hooks, melodies and riffs with songs often in a hurry to reach another memorable chorus. These are songs that suggest that this is how Steve Mason has always wanted Steve Mason to sound.